Illinois guard Ayo Dosunmu (11) rises up for a jumper during the game against Georgetown at State Farm Center on Tuesday, Nov. 13, 2018. 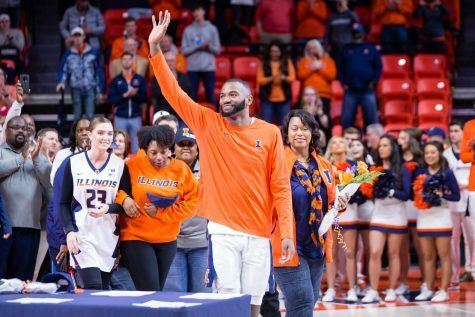 Illinois had an up-and-down battle against Georgetown Tuesday night in the team’s second game of the season. 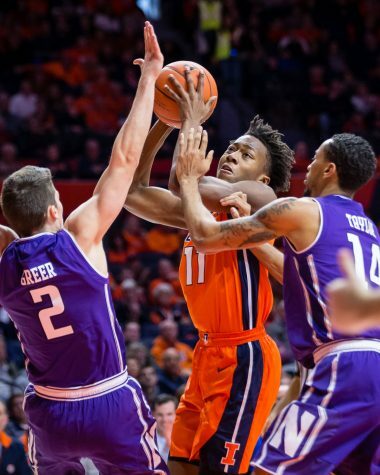 The Illini led early, but the Hoyas owned the boards and the paint, easily working the ball in from the perimeter for high-percentage scoring opportunities. Georgetown went 20-for-21 at the rim, with five dunks and 15 layups, while out-rebounding Illinois 39-26. It showed, particularly in the second half, when the Hoyas hauled in 25 rebounds compared to nine for the Illini, adding 11 second-chance points. Three Hoyas brought in over five rebounds, and three more had three rebounds each, while no Illini had more than five. 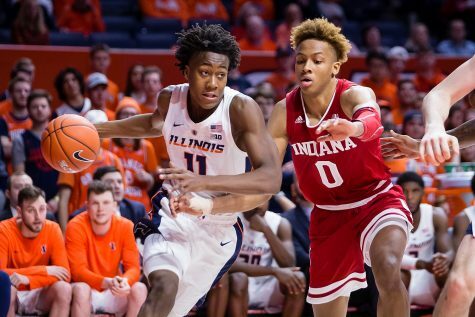 Freshman guard Ayo Dosunmu led the way for the Illini with 25 points (9-for-15 FG, 3-for-4 3FG). But elsewhere, the Illini lacked production. 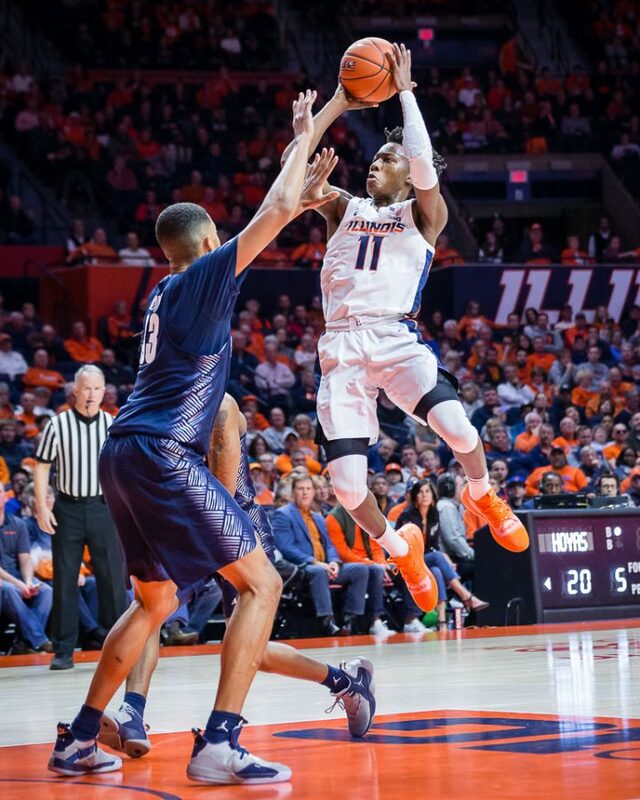 Sophomore guard Trent Frazier missed the game due to a concussion suffered in practice. 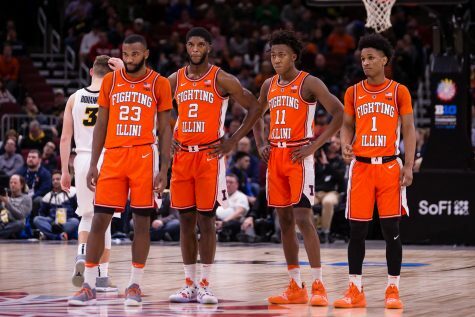 As a result, Illinois was flatter on both ends of the court, missing Frazier’s dynamism on the perimeter and off the dribble. Senior guard Aaron Jordan struggled in 23 minutes, scoring one point and going 0-for-4 from the field (0-for-3 3FG) with three rebounds and two assists. 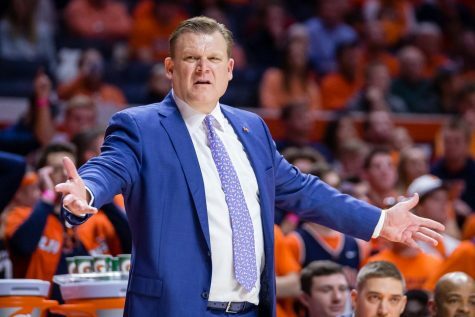 Head coach Brad Underwood lamented not having Frazier on the night and partially attributed Jordan’s struggles to it. Underwood was dissatisfied with his team’s defensive performance on the night. Georgetown shot 56 percent from the field (34-of-61 FG) and 33 percent from three-point range. 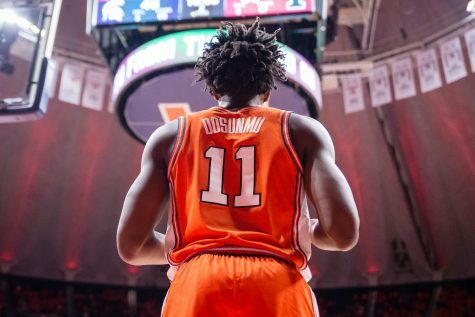 Though guards Andres Feliz and Da’Monte Williams had their moments, with three and four steals respectively, the Illini continually struggled to keep Georgetown from getting to the rim, especially after freshman forward Giorgi Bezhanishvili picked up his fourth foul around the 8-minute mark. It wasn’t only the defense that missed the mark during the night, though. 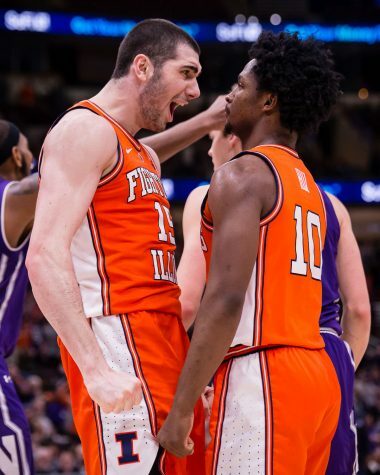 With Feliz into the starting five for Frazier, Illinois didn’t get much production off the bench, with 16 bench points compared to 38 for Georgetown. 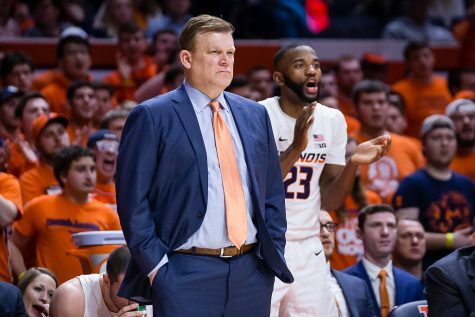 The Illini also had a 5-minute scoring drought in the first half from the 14-minute mark to the 9-minute mark, which allowed the Hoyas to take the lead. Junior forward Kipper Nichols put up 13 points, going for 6-for-12 from the field, but the Cleveland native wasn’t able to deliver in multiple key situations down the stretch. With just over four minutes to play and with an opportunity to take the lead, Nichols allowed Georgetown guard Mac McClung to steal the ball near half-court, finishing with a resounding reverse dunk at the other end to put Georgetown up 75-72. Nichols’ efficiency took a major step back against Georgetown after he went 5-for-7 from the field against Evansville. Underwood addressed it postgame, emphasizing his message to Nichols to simply put the game out of his head. 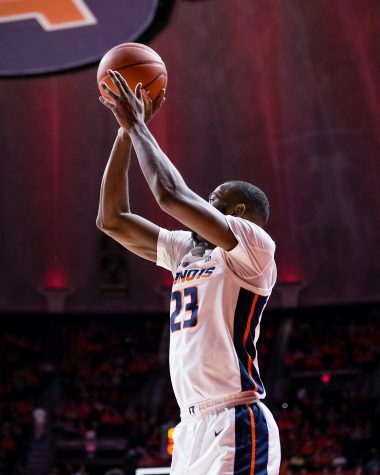 At the 1:31 mark, Nichols was unable to convert on a contested layup off a Georgetown turnover that would’ve put Illinois up 82-81. The next possession, Dosunmu found Nichols open near the top of the key for three, but Nichols’ shot missed, careening off the rim. 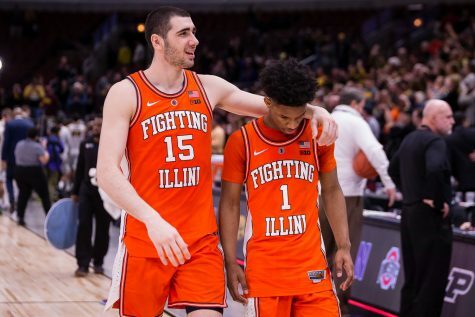 It didn’t spell the end for Illinois’ chances to win, but it was a major opportunity missed. Dosunmu criticized himself for the pass, which was a bit below Nichols’ hands but reiterated his trust in his teammate moving forward.